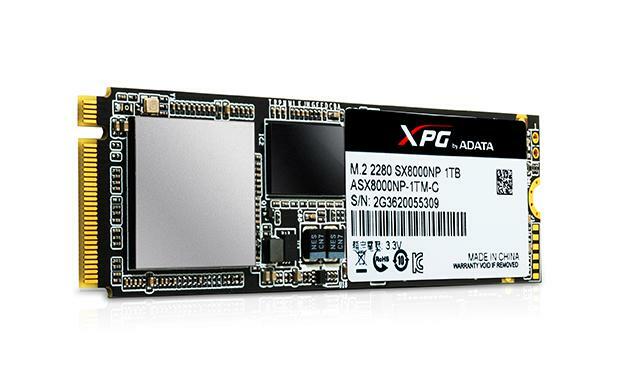 ADATA has launched a new M.2 3D NAND SSD part of the XPG (Xtreme Performance Gear) products, which are famous for their great performance and attractive style. The XPG SX8000 drives promise up to 2.4 GB/s read speed as well as the enhanced reliability of 3D NAND. The SX8000 meets NVMe 1.2 specifications and connects directly to motherboards via PCI Express 3.0 x4 (PCIe 3×4) to deliver the 2.4GB/s read and 1GB/s write, with 100K/140K IOPS. The SX8000 arrives in diverse capacities (128GB, 256GB, 512GB, and 1TB variants), ensuring a new generation of SSD performance is available to more users. A slightly faster version is fitted with an attractive XPG heatsink will release by the end of October, promising an aesthetic bonus for the case modding enthusiasts. What’s more, the SX8000 has merits in terms of its architecture – it uses reliable 3D MLC NAND Flash. This means that not only will it be more effective, but a smaller form factor and also decreased power consumption. According to the manufacturer, SX8000 features a 2 million hour MTBF (mean time between failures) rating, or 25 percent longer than 2D NAND SSD (which average 1.5 million hours). The SX8000 features full NVMe 1.2 compatibility, and powering a large performance boost that means users notice gains in real world scenarios, especially loading times within games that require the heavy asset streaming and in professional applications such as graphics and audio rendering. Adata says that a faster, heatsink-clad version of the SX8000 is coming in late October. Presumably the naked version of drive will be arrive beforehand. The SX8000 will be available in 128GB, 256GB, 512GB, and 1TB variants, all covered by a 5-year warranty.